AMDAMD shares will finally drop more than 30% to $US18 due to its comparative disadvantages in the competition with Intel, an analyst says. AMD shares will drop more than 30% to $US18 due to comparative disadvantages in its competition with Intel, New Street Research analyst Pierre Ferragu says. Last month analysts expected Intel to undersupply its 10-nanometre chip, but later a report said Intel may cure its production problem sooner than expected. AMD is expected to launch a 7 nm datacenter GPU later in 2018, which in theory should provide better performance than 10 nm ones, according to Moody’s. The 7 nm chip won’t help AMD win over Intel, Ferragu says. 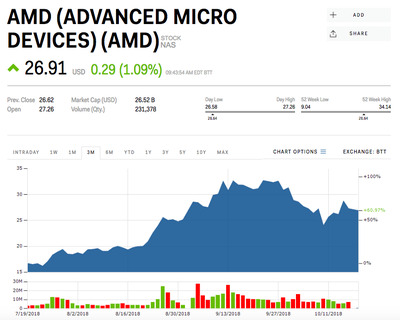 Watch AMD trade in real time here. 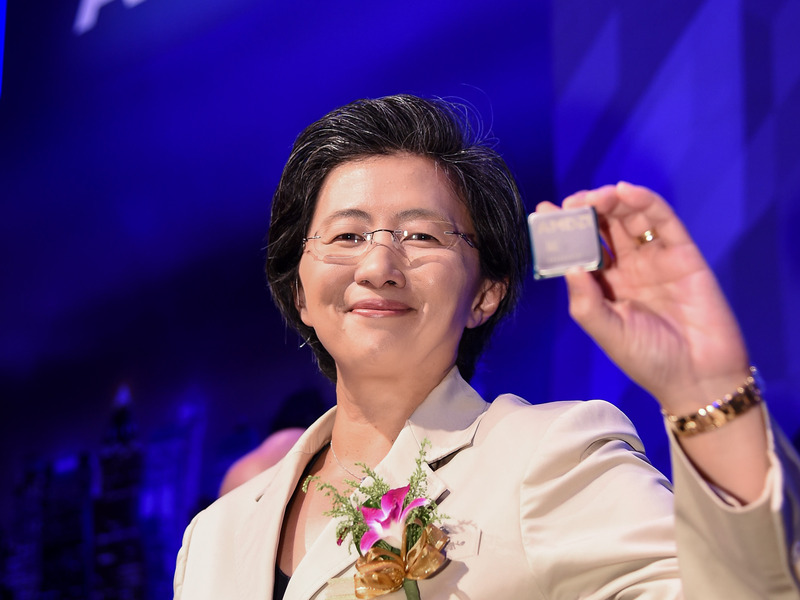 AMD is in a tough position competing with Intel, and shares will finally be dragged due to comparative disadvantages in its competition with Intel, according to New Street Research. “AMD’s stock price reflect a scenario we don’t believe possible,” said Pierre Ferragu, an analyst at New Street Research in a note sent out to clients on Friday. He sees shares tumbling by 30% -from almost $US27 to $US18. By his calculation, AMD’s current share price, if fairly valuing the company’s business, should be equivalent to a $US1.5 earnings per share in 2020. And to achieve that, the chip maker should sell at least $US2.5 billion server CPU and $US3.2 billion PC CPU, which in Ferragu’s eyes is impossible – especially when AMD is competing with Intel in the processor area. “Intel can easily bring to market an architecture similar to AMD’s, with better performance,” said Ferragu. He estimates AMD’s 2020 profit to be $US0.84 per share. AMD shares have been boosted by Intel’s 10-nanometre chip delay saga. 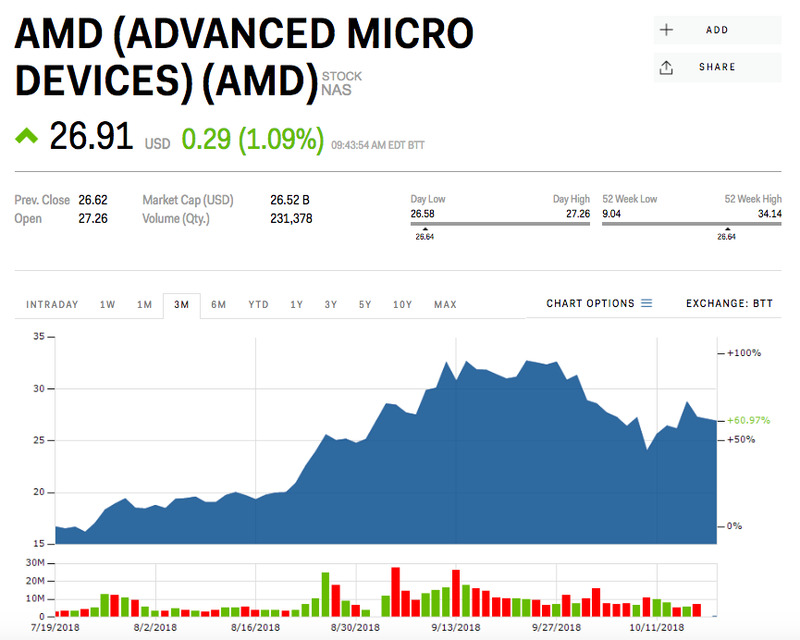 Last month, shares rallied after analysts projected that Intel would undersupply its 10-nanometre chips between the last quarter of 2018 and the second half of 2019 by 15%, benefiting AMD in the server and PC market. But later, a research report said Intel may cure its production problem sooner than expected, sending AMD shares down 4% immediately following the news. And while the ratings agency Moody’s recently upgraded AMD, saying it has sped up sampling 7-nanometre server processors, which in theory provide better performance than 10nm ones, Ferragu believes 7 nm chips won’t be a “game changer.” He added that back in 2014 Intel delayed its 14 nm chip deployment, but neither its PC CPU or server CPU revenue had been largely impacted. And millennial investors are dumping AMD from their portfolios on Robinhood, a no-fee trading app popular among younger traders. Over the past three weeks, AMD saw the biggest decline in the number of investors with a net drop of 13,677, or 8.1%. AMD shares were up 61% this year.